Nowadays many rock musicians are used to have side projects, where they include electronics. That's not something particulary new. 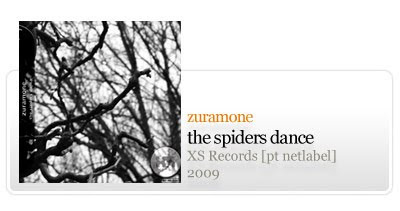 We were already used to see phenomena like this in the 70s and the 80s, and it was exactly what happened with alex (aka zuramone), the drums player from the evora's (south-west of portugal in the south-west of europe) band "lotus mecanica". He was also drummer in the les baton rouge band and he is involved in another band with musicians from les baton rouge, great lesbian show and ideas for muscles. Musically we can say that Alex's band (zuramone), is actually some sort of rockabilly stuff, and although this is not particulary very close to rockabilly, it ended by being like some sort of hybrid between some drum n bass (sometimes close to photek when the acoustic drums appears), and something close to trance music, reminding me some aproaches in shpongle. In short, hardware electronic instruments, like drum machines, synths and so on, then a couple of guitars, and some drums.